Rochester Champs Elysees is a 4 star hotel located just a short walk to the Champs Elysees and the Rue du Faubourg Saint-Honore. Rooms are equipped with LCD TV, DVD player, minibar, WiFi access and a private bathroom with bathtub. An American-style breakfast buffet is served daily at the hotel's ground floor lounge and guests also have the option of a continental breakfast served in their room. In addition, the hotel also features a bar and lounge that offers a choice of beverages. Leisure amenities include a well- equipped fitness center and a spa. Attractions within just a few minutes drive from the hotel include the Eiffel Tower, Arc de Triomphe and Parc Monceau. Charles De Gaulle Airport is 31 km and Orly Airport is 25 km from the hotel. The ROCHESTER CHAMPS ELYSEES is a Tourist, Pet Friendly, Traditional, Business, Honeymoon, Full Service, Child Friendly hotel. Located in City Centre - Champs Elysees area. Shopping is accessible by bus/taxi and the nightlife/restaurants are easily accessible by taxi or bus from the hotel. 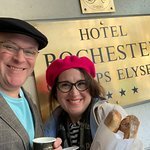 Descriptionclass="small" style="text-align: justify; font-size:11px;">Rochester Champs Elysees is a 4 star hotel located just a short walk to the Champs Elysees and the Rue du Faubourg Saint-Honore. Rooms are equipped with LCD TV, DVD player, minibar, WiFi access and a private bathroom with bathtub. An American-style breakfast buffet is served daily at the hotel's ground floor lounge and guests also have the option of a continental breakfast served in their room. In addition, the hotel also features a bar and lounge that offers a choice of beverages. Leisure amenities include a well- equipped fitness center and a spa. Attractions within just a few minutes drive from the hotel include the Eiffel Tower, Arc de Triomphe and Parc Monceau. Charles De Gaulle Airport is 31 km and Orly Airport is 25 km from the hotel. I have stayed here on 2 seperate business trips and both times have been excellent stays. The staff on hand at the hotel can't do enough for you, always greeted with a smile and very understanding of my poor French. I've had a room on the third floor towards the middle of the hotel overlooking the courtyard area, and on the first floor at the front of the hotel. In my opinion I preferred the room on the first floor at the front of the hotel. This is because the room had an outdoor seating area which would be perfect for warm summer evenings. Whenever I would stay I would need the use of an iron and ironing board. Whenever I would call down to reception for one, within moments there would be someone at the door with one for me. The breakfasts could either be delivered to your room or you can go down to the bar area and have breakfast there. I preferred to go down and have breakfast as you had more options available to you. The breakfasts were exactly what you needed to start the day. The location is perfect as it's a short walk to Champs-Elysees & Arc De Triomphe. For where I needed to be every morning it was another short walk. Lots of restaurant choices around and easy access to the Metro. Whenever I have a business trip to Paris, I will make sure to book here as I know I will have a great stay. Thank you for taking the time to share your fantastic review about your stay with us. We are delighted to read that you enjoyed excellent service throughout your stay. It would be our absolute pleasure to welcome you back! Very nice hotel with good location. It is only two blocks from Champs Elysee. It is up to date and well maintained. they were nice in the front desk. It is quite and very clean. Room size is adequate. Breakfast was good. Highly recommended. Thank you for sharing your experience on Trip Advisor. We are delighted that you enjoyed a beautiful stay! Extremely clean and comfortable. Friendly and accommodating staff, bilingual. Perfect location to walk to most everything- or a short taxi/Uber ride. Very good cafes and bakeryâ€™s a stones throw away.Room was spacious and very nice. Highly recommend! It is great to read how good you felt from arrival to departure in our hotel. There is nothing more motivating for us than receiving feedback like yours to continue providing services beyond our guestsâ€™ expectations and also building memories. We hope to welcome you again soon in Paris. Fantastic hotel with wonderful staff! We spent three days here as a pre cruise holiday.The hotel was chosen by Viking cruises and it certainly did not disapppoint.We were given a very warm welcome at Reception and our room was ready before the allocated time.Our room was lovely.Very modern with all amenities including slippers and bathrobes.The room was tastefully decorated in soft shades of grey and burgundy.I had requested a walk in shower and this was acknowledged.The shower was brilliant-right temperature,plenty of pressure and easy to work! The room was very well serviced daily with bottled water replenished as well as the luxurious toiletries. Breakfast was amazing! Such a wide choice, from fresh pastries to a great selection of cold cuts.There were hot foods also so no one missed out on a "full English" if they wanted it.Staff in the restaurant were efficient, friendly and helpful as were all the staff in the hotel.The hotel also has a vey well equipped gym and spa.My only slight negative was the noise from the street, which also had two nightclubs opposite! However,once the window was closed we heard nothing.Also the building directly across from our room was so close we could see inside, so I dare say they could see into our room!We just kept the voile curtains pulled over.Not a big deal.I can honestly say this has been one of the best hotels I have ever stayed in and we travel extensively.I even left the hotel a thank you card and I have never done that before! I would certainly recommend this hotel to anyone and thank you to Viking for choosing such a great hotel for us! Thank you so much for having taken the time to review us on Trip Advisor. We were absolutely thrilled to read your lines and see that our team members and facilities were able to contribute to making your stay a memorable one! We were delighted to read your positive feedback about the property and food. Thank you again for your card and for recommending our property. I picked this hotel because of its style and character. Meters away from the Champs-ElysÃ©es, this beautiful hotel is located on a quiet street although remember you are in the centre of Paris, not in the countryside so you can always expect a very small amount of noise if your room has a street view. The hotel is beautifully decorated throughout and won't disappoint. The staff at reception are efficient, very friendly and knowledgeable about the area. Well done to them. The welcome drink, a glass of Champagne is a nice attention to detail. Rooms are nicely designed, clean and warm. The bed was very comfortable and I just wished I could have enjoyed it more.There are plenty of options for breakfast, all tasty. I particularly liked the small round bread and the selection of cheeses and cold meats. It's less than a minute walk away from the metro and there are several banks, restaurants and shops within 500 meters. An excellent bakery round the corner too. I very much enjoyed my stay at the Rochester and will definitely stay again. Thank you very much for your review and for this nice comments about our establishment and our teams! Your satisfaction is our priority and we are delighted to read that you had a great time with us.